My more technical book on the feet. Can we unlock whole-body movement when our feet have been bound for decades? With over 20 exercises (for more than just the feet! 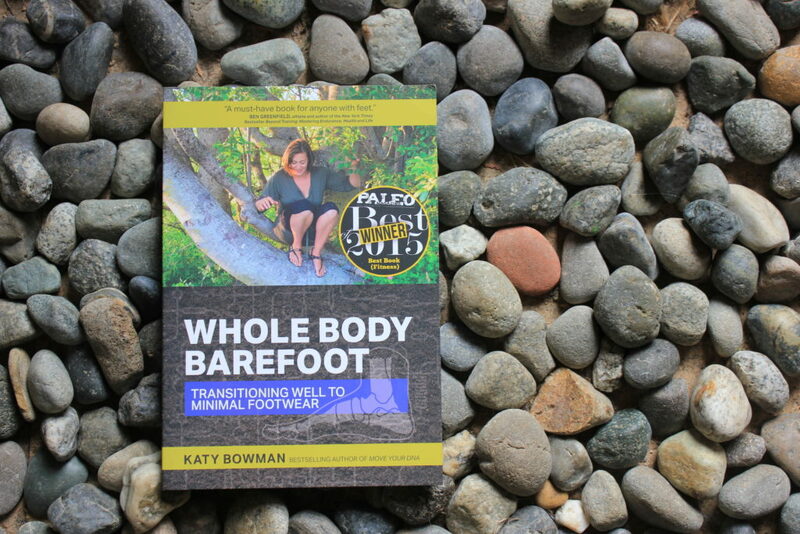 ), Whole Body Barefoot is a must-have for anyone hoping to restore lost foot function and improve their health. Side effects may include stretching your calves on random objects throughout the day. Maybe you’re a flip-flop lover feeling pretty relieved because your flip-flops seem minimal—flat, wide, and flexible. They’re also “open”—an important component of the “natural” argument, as they allow for greater sensory input in the form of air pressure and temperature. It’s true, flip-flops are SO CLOSE! But flip-flops fall short of being minimal-for-the-purpose-of-natural-gait in a vital way—they don’t connect to our feet. We have to work our muscles unnaturally to keep them on. (Unfortunately, this toe-gripping action is necessary for slides, mules, and many slippers, too.) After a while, the toe-gripping motor pattern leads to shortened toe muscles (and a loss of parts that allow movement) which can then affect things like balance and foot arch strength, and lead to toe contractures, a.k.a. hammertoes. New flip-flop research also shows that “working to keep the shoe on” changes many things about your gait, which means they end up affecting more than the feet. To keep your natural stride (and shoe) on and enjoy the feel of the sea breeze and sunshine on your skin, or the grit of dirt and the freezing cold air of a Canadian fall, opt for something that looks more like a Greek sandal. You know, all strappy and minimal but still fully connected to your foot. If you look around, you can find uppers that are very minimal as far as mass goes, but engineered in a way that keeps the shoe on without you needing to tighten your toes. Try an exercise from Whole Body Barefoot! Stand with your feet forward, ankles pelvis-width apart. Press the front of your foot into the ground. Slowly lift your heels away from the ground without overly moving your pelvis forward. Keep your ankles straight (don’t let them drop outward, as in top left photo) and continuously press the ball of the foot into the floor. Toes should be lift-able throughout the entire exercise. Eventually work up to doing this exercise one foot at a time.